Solar energy in kerala is set to recieve a major boost, all thanks to the 10,000 Solar Home Project, which got a final go ahead from the indian government. 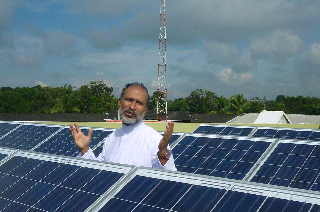 Project involves installing Solar panels in 10,000 homes in the south Indian state of Kerala. Each project will have a nameplate capacity of 1KW. Which will equate to about a total of 10MW of distributed Solar power in Kerala. These projects will be constructed in roof tops due to the unavailability of large open land. Goverment will provide 60% of the total cost of the system as subsidies, which will be about 1.5 Lakhs (~$2700) of the total project cost of 2.5 Lakhs (~$4500). The Project will be constructed in such a such way that, all districts will be given equal priority. But the power hungry district of Ernakulam is set to recieve a good chunk. Agency for Non-Conventional Energy and Rural Technology (ANERT) will be overlooking the whole project which has a total valuation of more than about 250 crores ($45 Million).